While the Superbowl was a bit of a bust, lawyer Jamie Casino is being widely heralded as scoring a touchdown with his local commercial during the game in Georgia where he tells his life’s story as an advocate for clients. Since I have already ventured into film critique this morning with the students of Columbia, I might as well say my peace about the film of Mr. Casino despite the overwhelming popularity of the commercial. I found the commercial below to be unprofessional and self-serving and just a bit creepy. What is striking about this story is that it was not long ago when such an advertisement would have been viewed as an ethical breach. I did not support those earlier rules against advertisements. However, Casino has a history of such commercials that trade content for flashy effects along the lines of a car salesman or infomercial pitchman. Casino’s commercials has been called “moving” and “impressive” and even “the best commercial during the Superbowl” by national media and commentators. (I will not question the comparison with the other commercials since I have already expressed my view that this year’s selection was the worst in many years). For that reason, I was looking forward to watching it. I literally did a search to be sure that this was the commercial that everyone was talking about. I found the video to be uncomfortable to watch as Casino seems to live out his fantasy of being some action figure with tight jeans and a flaming sledgehammer with a cross on it. Sort of Nicholas Cage meets Clarence Darrow meets El Mariachi. 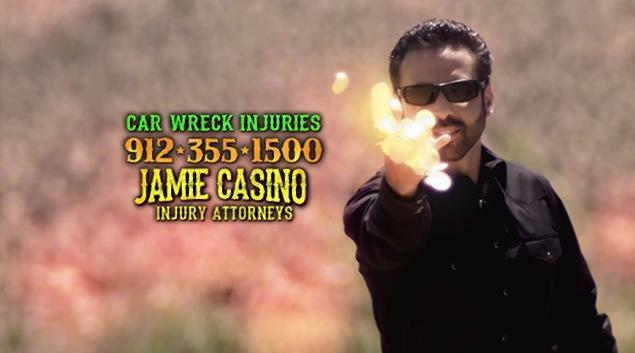 While some have said the commercial also tried to clear the name of Casino’s brother Michael Biancosino, 30, and Emily Pickels, 21, who were shot and killed in Biancosino’s vehicle during Labor Day weekend 2012, he seems much more about him. There is a legitimate grip about the insulting statement of then Police Chief Wille Lovett in a press conference, that “There were no innocent victims.” (Lovett, 64, who retired in October after the disclosure of sexual harassment allegations, actually said a week later that did not mean to imply Biancosino and Pickels were involved in impropriety but that they were the victims of mistaken identity. I fail to see how any professional police officer, let alone a chief of police, could say such a hurtful and frankly moronic thing). However, the commercial was about Casino not his brother and how he became this superhero champion of voiceless and innocent. Of course, the real superman does not normally require an hourly rate or contingency agreement before stopping the speeding train. Casino has hit the jackpot with the commercial which has been viewed over 2.5 million times. Questions of effectiveness and taste in advertising are matters of speculation and subjective judgment. Some jurisdictions have had extensive prohibitions against television advertising, against advertising going beyond specified facts about a lawyer, or against “undignified” advertising. Television is now one of the most powerful media for getting information to the public, particularly persons of low and moderate income; prohibiting television advertising, therefore, would impede the flow of information about legal services to many sectors of the public. Limiting the information that may be advertised has a similar effect and assumes that the bar can accurately forecast the kind of information that the public would regard as relevant. I am clearly in the minority on my response to the Superbowl ad but you can judge for yourself below. Florida enacted some fairly strict advertising rules. I then moved to New Mexico and was reminded of the good ol’ days in Florida. One commercial showed a young woman in multiple casts and using crutches and a neck brace. The more the voiceover spoke, the more casts flew off, until by the end of the commercial she was smiling and dancing with fistfuls of money. Having moved back to Florida, it looks like the rules are still in place. One of the best commercials I’ve seen had the attorney talking about how he became an attorney. He was working in construction and received a serious back injury, bad enough that he couldn’t go back to doing what he did. So, during breaks in therapy, he went back to school and became a lawyer. Since my family has been in construction for decades, his story appealed to me. As it happens, I’ve followed some of his work and like it, so I’d probably contact him first if I needed a personal injury attorney. The commercial says simply “here is who I am and here is what I do”. It made no promises and certainly didn’t have bundles of money in client hands. I am uncomfortable with lawyer advertising, but the rules in Florida seem reasonable. How much pompous, snottiness, emotional babbling banter goes around. SHEESH! Again – Binder and Binder has been advertising for a LONGGGGgggg time. Is Binder “buying” a reputation? Does Coke and Pepsi – “BUY” a reputation when they advertise? simply because you don’t approve! Again – I say – SHEESH! When one is blessed that their family, connections and/or money gets them into Harvard; are they “buying” a reputation? The University is most certainly selling one! and why our nation was deprived of a “legitimate” GOP candidate last time. Our nation is so full of bull – that no one can see the plain truths anymore. Lawyers who advertise are trying to buy a reputation. People who are dumb enough to go to see the lawyer on the billboard are dumb enough to get fleeced. They probably go to church and get fleeced by some Pastor. If you are up itShay creek and need a lawyer then go yak to folks at the courthouse and the legal community or at a good bar and learn who it is that is getting good results in your town. I bet it is not that schmuck who is on tv accentuating his southern accent or lying about his skills. Never go to a lawyer who advertises. They are paying for something which they don’t have– a reputation based on facts. I would like to thank Mr. Casino for making a great effort to convince me not to hire him for any furture legal services. Now, there is no doubt I would go to another firm. The ads were like some over-the-top action movie, or more accurately a movie portraying the child of The Terminator and Buffy the Vampire Slayer. Thse ads reflect badly on the profession. I agree. Should something be one about it? Well that’s up to the bar association. I could go either way. I can see having an advertising program that has items to help people remember them. The hat with Binder & Binder being one of them perhaps and it is not really that bad in my view. Or to call Harold Carr for your car injury claims. But after I watched Mr. Casino’s ads, I thought we are stepping closer to what was shown in the movie Idiocracy. You know – Professor, I’ve offered (in the past) that I would waive my monies due, stolen from me and such – if justice would just come. They simply laughed and said I can’t waive what is already gone! What remains a reality, is the fact that I’m a tenacious, formidable opponent to Romney and his cohorts, even indigent. Hence, they could never have me returned to being a man of substance. (Because I would fight them on the web in ways just as powerful as Mr. Casino does). There are many cases – you and yours turn down – because you feel you don’t have the time (and some other babbling, banter obfuscating). Then you go and spend your time grandstanding on this stuff. “Silence in the face of evil is itself evil: G-d will not hold U.S. guiltless. “not to speak is to speak. Not to act is to act”. We dang near elected a RICO boss as President of the United States (and now there’s much banter – with Christie’s inevitable demise – Pitten’s may run again). because you think your Mr. Casino article is more worthy of your time! I wonder if this guy has Punisher envy? Laser, you chose to claim that Mr. Spinelli was comparing apples to kumquats. You then compared Casino to Binder; a very flawed comparison because Binder (although he has a legal education and may still be a member of the bar) is not offering services that are regulated the way that Casino’s law firm services are, which is at the crux of Prof. Turley’s analysis. You need to find a better analogy. I thought Binder just played an attorney on TV.